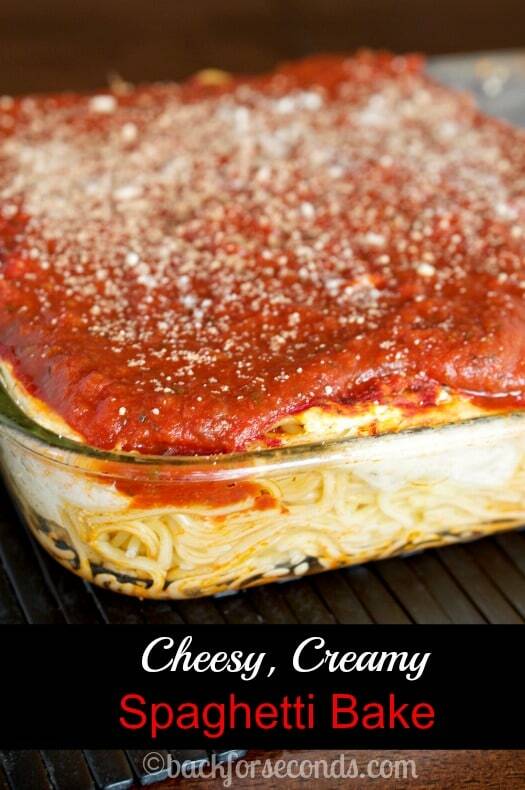 This easy Cheesy, Creamy Spaghetti Casserole is total comfort food! It takes just a few minutes to put together and the result is something everyone loves!! There are many times when I look at the clock and somehow it’s already 5pm and I have no idea what to make for dinner. Does that ever happen to you? I am so bad at meal planning. Meals like this come from nights like those. Very little time, and I need a satisfying meal that everyone will love. This was a hit! 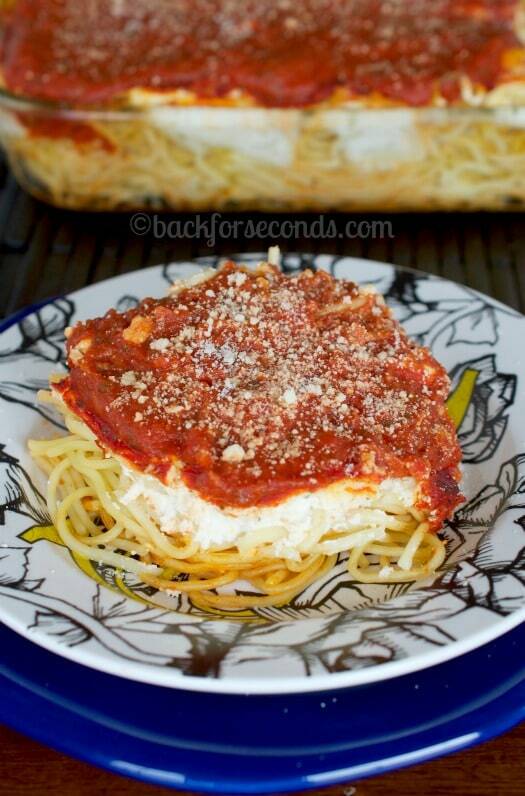 This is sort of a mash up of spaghetti and lasagna. 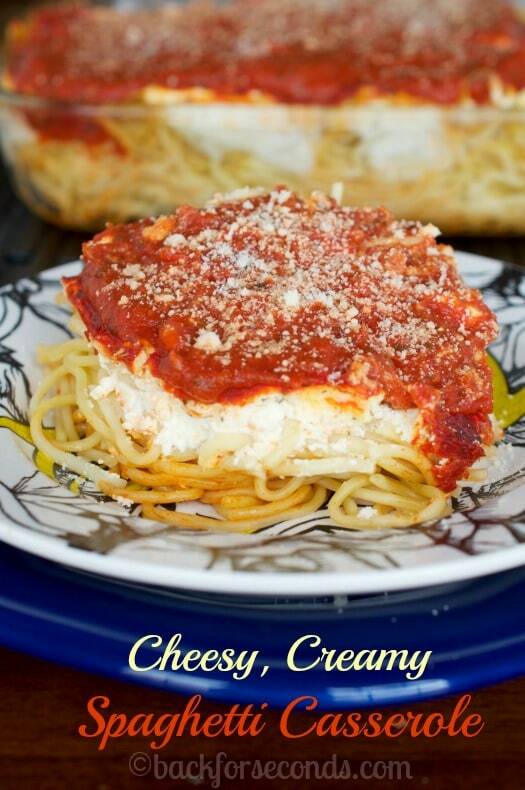 It’s cheesy, creamy, saucy, and delicious!! It also makes a lot of food, so invite some friends for dinner, or enjoy the leftovers for lunch! I don’t eat ground meat, so I made this meatless for my family, but if you like a meaty sauce go ahead and brown some meat and stir it into the sauce. Add this to your list of go-to meals on busy nights. Enjoy! Great last minute pull-together meal! Such a great dinner idea! The perfect comfort food! This is absolutely perfect! I might substitute zucchini noodles in this to make it low carb! Did you make this with zuchinni noodles? If so, how did you do it and how did it turn out? I’m trying to go low carb also. Made it tonight using zucchini noodles. Nope. It was like a delicious soup. I think it needs the starch from the noodles to soak up some of the goodness. None the less it’s a delicious lowish carb soup we’re eating! Did you try baking the zucchini noodles first! I make lasagne and enchiladas with zucchini and this helps a lot! I make zucchini boats and always poke drain holes in them. Sinking zucchini boats! I am thinking of adding some diced cooked chicken under sauce and cheese to make it si liar to a Parmesan chicken.